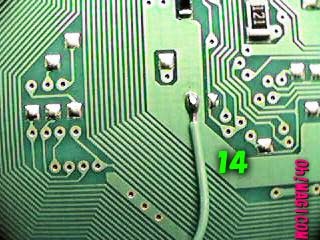 Connect to #16 in the next illustration if you have a 5-wire chip designed for operation on both 100x/550x models. 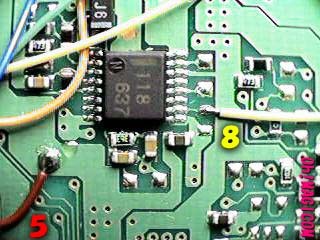 There are two options here, a connect to 3.5V, which will operate with all chips I'm aware of, or a connect to 5V, which will give more reliable results with 4-wire chips. 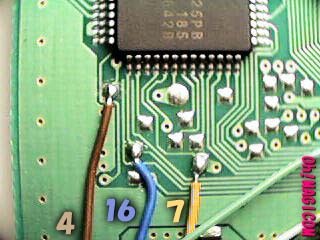 A 5V Vdd will operate with the chips I sell, but I can't guarantee that other vendors' parts will work. Note - this location is about 1cm to the right of pin 4 of the PIC in the first photo. Pictures taken from Oh! Magicom, which seems to have disappeared, sadly.